Who was this Professor Anderson? Did he really cook cereal in toy cannons? I had to know more! Although the true story is not quite so outlandish as the commercial suggests, I found Anderson’s tale to be a fascinating anecdote in American breakfast history. It was December 1901, and Dr. Alexander Anderson had an idea. The botanist wanted to prove that cornstarch granules stored an infinitesimal amount of water in their central nuclei. After months of experimentation, Anderson realized that a small explosion might produce the results he sought. He added powdered starch to glass tubes, sealed them, and placed the airtight containers in an oven. Anderson then heated the materials to over 400 degrees Fahrenheit. He removed a still-hot tube and struck it with a hammer—pow! The starch granules transformed into a porous, fluffy white substance. The tube had pressurized as the temperature rose, while the hermetic seal prevented the water in the starch from boiling. When the tube cracked open, the pressure dropped, and the water in the starch immediately vaporized and expanded—making puffed cornstarch. 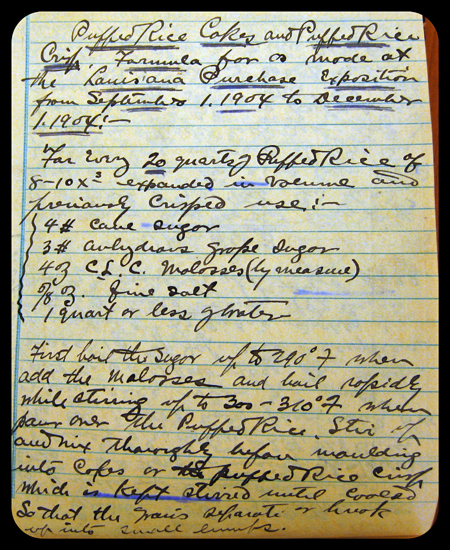 In 1902, Anderson conducted more experiments to puff rice, wheat, and other starches and seeds. The botanist knew he had accomplished more than proof of his hypothesis; Anderson’s invention presented an opportunity to expand upon the growing market for cold breakfast cereals. Americans first encountered the now ubiquitous dish in mid-nineteenth century health spas, called sanitariums, which promoted exercise, nutrition, and some rather unorthodox medical treatments. In 1863, James Caleb Jackson, proprietor of the "Our Home on the Hillside" sanitarium in Danville, Connecticut, invented the first ready-to-eat dry breakfast cereal. The product, named Granula, fit well with the restorative and healthful vegetarian diet Jackson promoted. The recipe was simple: graham flour mixed with water, baked, crumbled into pieces, and baked again. The brick-hard chunks that resulted were only edible after soaking in milk or water for at least twenty minutes. Unappealing though it may sound, Jackson’s bland Granula inspired a parade of imitators and innovators. 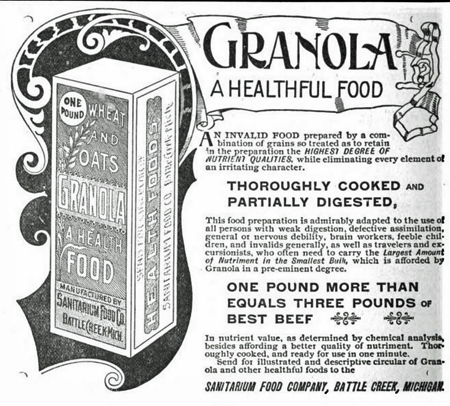 In 1877, fellow sanitarium owner Dr. John Harvey Kellogg began offering patients his own version, called Granola (swapping Jackson’s “u” for an “o” to avoid a lawsuit). With the assistance of his brother W.K. Kellogg, an astute businessman and later founder of the eponymous cereal brand, Dr. Kellogg began advertising and selling the cereal outside of the sanitarium. By 1889, Dr. Kellogg was selling two tons of granola per week. Six years later the brothers invented a more palatable alternative—cornflakes. In the following years, more businesses sprung up in response to cereal’s growing popularity, including the Natural Food Company (creators of Shredded Wheat), Post, and Quaker Oats. As cereal spread to an increasing number of American homes, Anderson believed his invention had commercial potential. 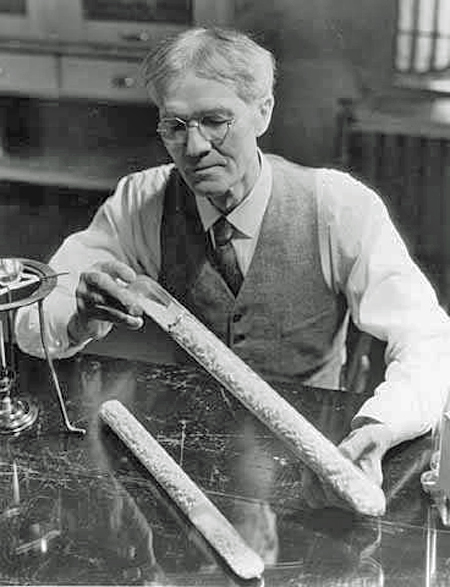 In 1902, he received US Patent 707,892 for “a dry method of swelling starch materials of all kinds to render them porous, thereby enhancing their nutritive value and rendering them more readily and completely digested.” The following year he signed an agreement with Quaker Oats to begin large-scale production of puffed rice and wheat cereals. 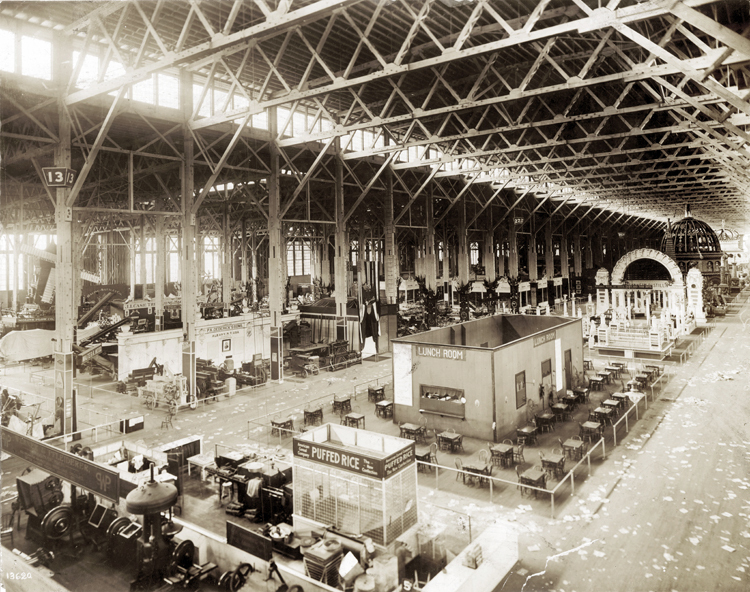 In 1904, Anderson traveled to St. Louis to promote his invention at the World’s Fair. The Fair offered Anderson an impressive stage on which to publicly debut his work. The event’s organizers had erected over 1,500 gleaming white buildings across 1,200 acres of land. A gigantic Ferris wheel, a grand lagoon (complete with gondolas), and eleven monumental “palaces” punctuated the landscape. The scene was, in the words of one attendee, “indescribably grand.” Famous inventors like Thomas Edison and Alexander Graham Bell were in attendance, along with an estimated 20 million other visitors who flocked to the grounds over the Fair’s seven months of operation. Such a grand venue demanded a dramatic demonstration. Anderson brought a new, larger version of his original puffing gun. Eight twenty-inch-long bronze tubes were substituted for the small glass containers, and a new firing mechanism replaced the hammer. Anderson loaded each of the cannon-like cylinders with six pounds of raw rice, sealed them shut, and began turning the contraption over heat. He aimed the device at a large cage and—boom! A shower of puffed rice shot into the cage, surprising and delighting the audience. Assistants bagged the puffed rice and sold it to onlookers for a nickel. Over the course of the Fair, Anderson and his team repeated the explosive show, puffing more than 20,000 pounds of rice and selling a quarter-million packages of cereal. Throughout his life, Anderson continued to refine and improve his invention. By his death in 1943, he had earned twenty-five US patents, including one in 1933 for a continuous puffing gun. 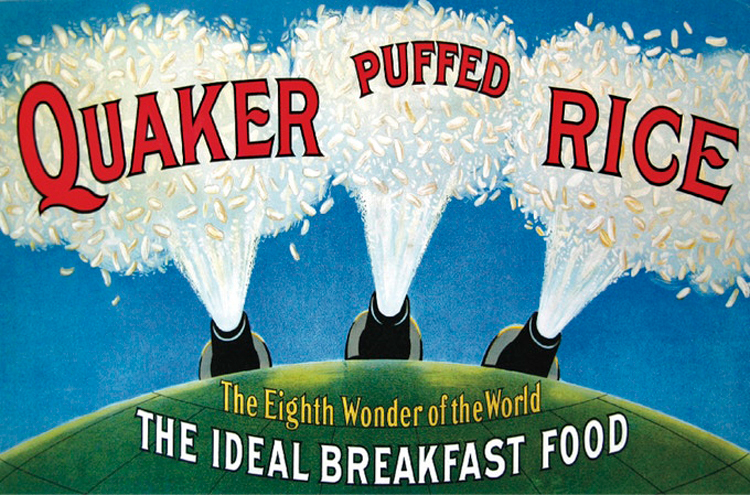 Quaker Oats called the research and development of the various puffing guns “Prof. Anderson’s Gift.” All of us who have enjoyed a bowl of Cheerios, Rice Krispies, Kix—or any of the many other puffed offerings that came to define American cereal manufacturing in the twentieth century—would have to agree! Lisa Vargues, “Breakfast in a Blast: The Invention of Puffed Cereal at NYBG,” New York Botanical Garden: Science Talk, May 8, 2015, https://www.nybg.org/blogs/science-talk/2015/05/breakfast-in-a-blast-the-invention-of-puffed-cereal-at-nybg/. Henry Adams' influential but largely forgotten warning about science superseding soul is especially relevant today.